Leave me comments, suggestions and feedback! Also let me know what is the next boardgame you want me to review! 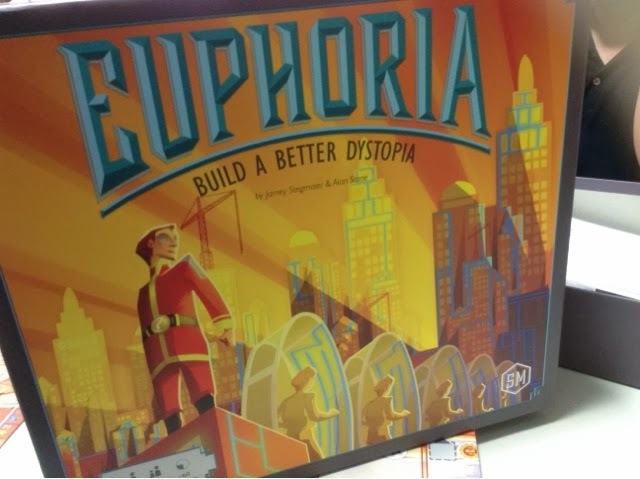 Euphoria is the 2nd release by Stonemaier Games; and if you have played their first release - Viticulture - you should know to expect that the production values for the game is going to be through the roof. Well, Euphoria does not disappoint in this aspect. In fact, the production values for Euphoria is practically out of this world ( forget about the stupid darn roof ). I have not seen any other game with production quality and bits this good. This will not seem like it was a Kickstarter game. The gold pieces feel and look like it could be real gold, and the clay bits have such great texture and detail to them that you would wish they had made it the same on all four sides so you could build houses with them. Everything production wise is simple top notch in Euphoria. How about the gameplay you say ? Well, on to the juicy bits ! 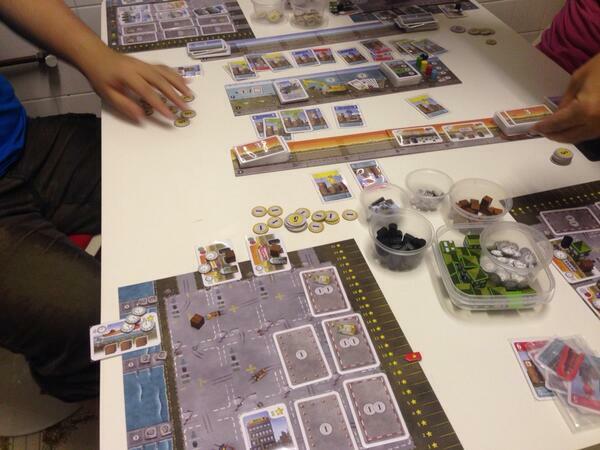 Bremerhaven is a new release from Lookout games at Essen 2013. The box art immediately reminds me of Le Havre because they are from the same artist but the designer is new and this is his first game. 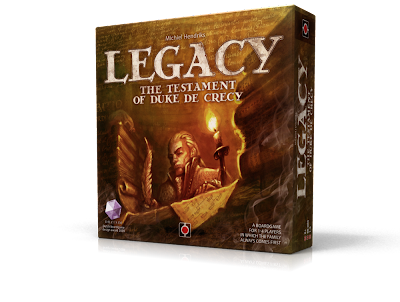 In a nutshell, it is a light-medium weight euro style mostly card-based game. Players are bringing in ships which has cargo and trying to fulfill contracts to earn money. 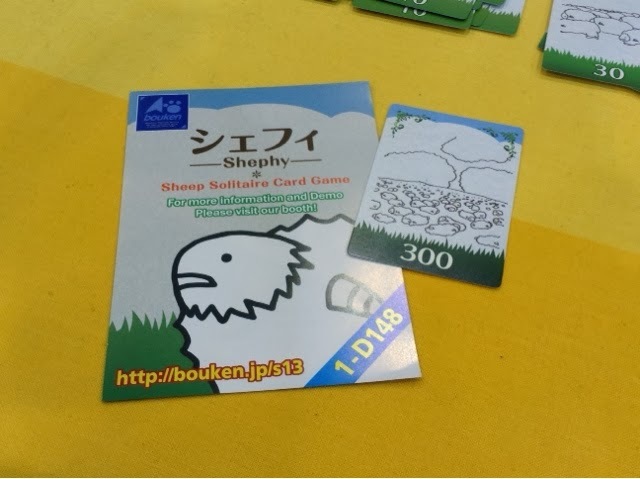 The game ends after a certain number of rounds, determined by "newspapers" which also depicts events and the player with the most points (multiply the money they have with the points they received from buildings and ships) will be the winner. 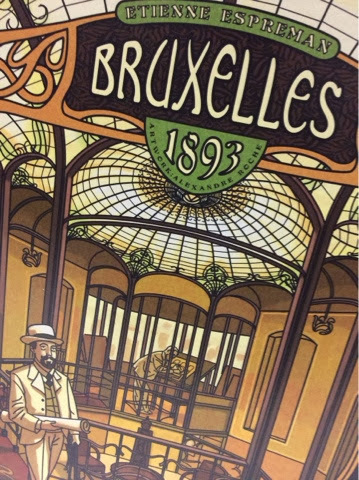 Over the recent weekend i managed to get in 2 games of Bruxelles 1893 - another Essen 2013 release. I could sense from the way Eric talked about it that it was quickly becoming one of his favorite games. So, in order to hurt his feelings, i am going to purposely write a bad report about it. Haha. No i kid, my genuine impressions of the game can be found below. I'm a little apprehensive about posting a variant in which i have yet the opportunity to try, but seeing that i won't have the chance to play the game anytime soon ( i don't own a copy ), i was wondering if others who own the game may have a chance to test the variant and see if it's any good ? I had thought about it before falling asleep last night and decided to jot it down before the information gets lost along the way. 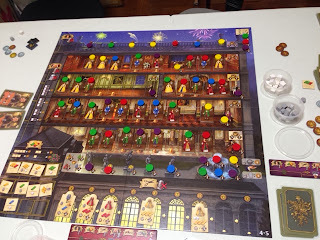 Push Your Luck Podcast Episode 25: Feld-stravaganza!!! 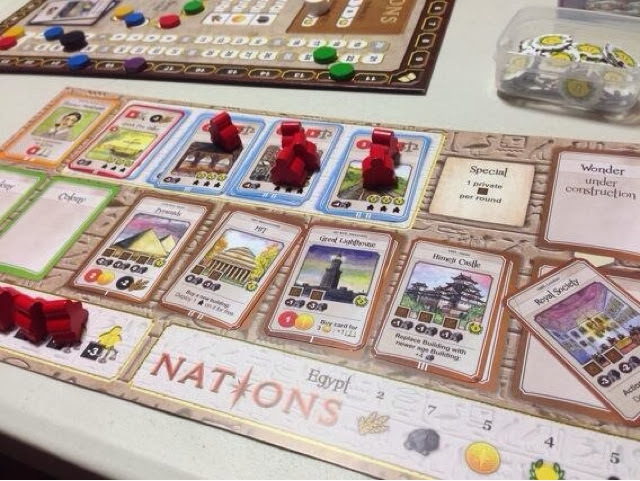 Joel Eddy joins Eric and Jonathan as they talk about Stefan Feld and his 4 releases for 2013. They chat about each of them and how they are ranked against each other. 3:34 - Bora Bora 21:43 - Rialto 34:34 - Bruges 47:18 - Amerigo Push Your Luck Podcast is now a proud member of The DiceTower Network. Do check out the other amazing podcasts in the network. Also check out the Jack Vasel Memorial Fund Auction on Boardgamegeek! Leave us comments and questions at our guild on Boardgamegeek and leave us a review on iTunes. Do visit our website www.pushurluckpodcast.com where we will have video and written reviews, session reports and other nifty posts! subscribe to it here http://feeds.feedburner.com/PushUrLuckPodcastpulp Thanks! Suburbia was released last year ( 2012 ) by Bezier Games, and after playing it at Eric's place, i was so blown away by how good the gameplay was that i immediately went out to get my own copy. 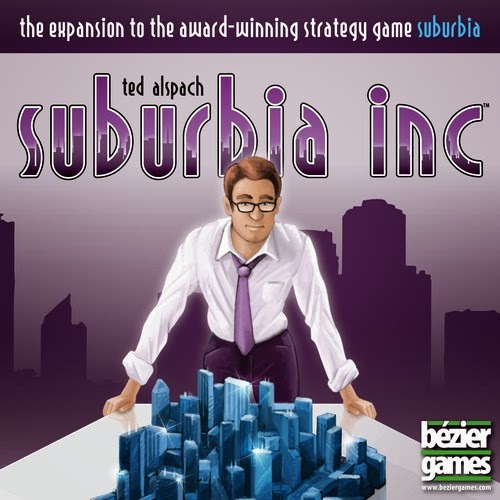 It's quite possibly the best city building board game in the market right now ( or ever ). 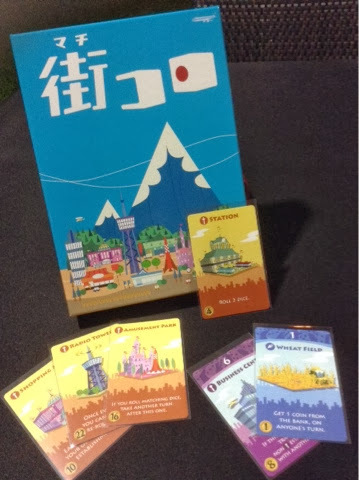 Recently at Essen, they released their first expansion for Suburbia titled Suburbia Inc.
Well, the last Japan game for our game night was none other then Machi Koro !! I've played this only once prior and though I enjoyed it, it didn't tickle my fancy as much as I had hoped it would. So I decided to break it out again and give it another twirl. 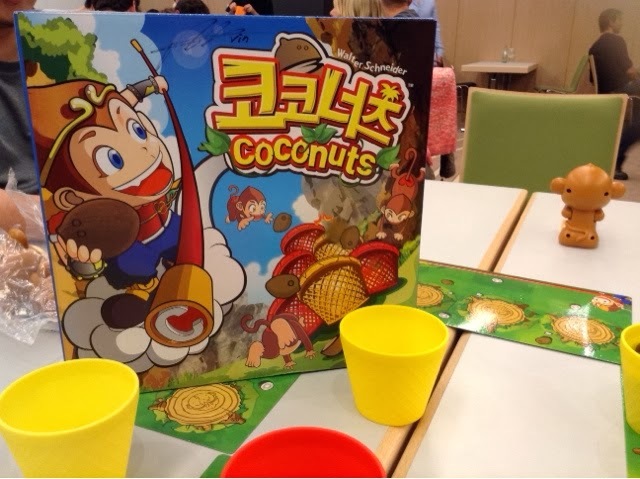 The second game of the night was published by AEG recently but was originally a japan release and that is Cheaty Mages. 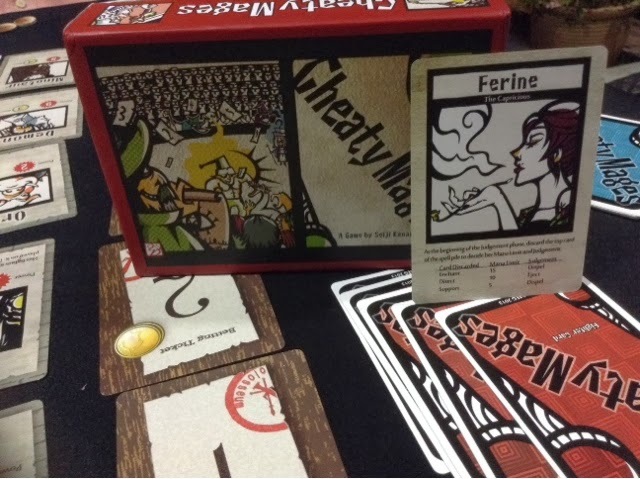 Cheaty Mages is a betting and bluffing game where players are trying to accumulate the most money after 3 rounds of play. Each round, 5 combatants and 1 judge are placed face up on the table. Players are then dealt a certain number of cards depending on the number of players. Before any action begins, each player must then place one to three bids on any of the 5 combatants. Each player may not place more than one bid per combatant. The catch for the bids is this, if you place only one bid, you will receive double the face value if you win, of you place two bids, you will win the face value, and if you place three bids, you will only win half the face value rounded up. So bidding on more combatants is not always the best way to go. Having recently had the chance to break out most of the Japan games i bought from Essen, i just thought i would share my group's experiences with the games we played. 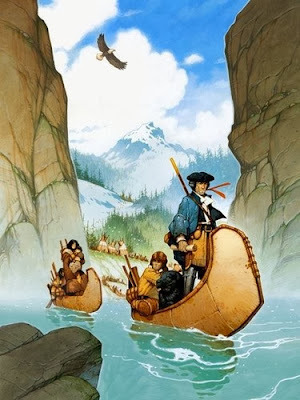 Lewis & Clark is a game that I have been excited about since reading about it before Gencon 2013. 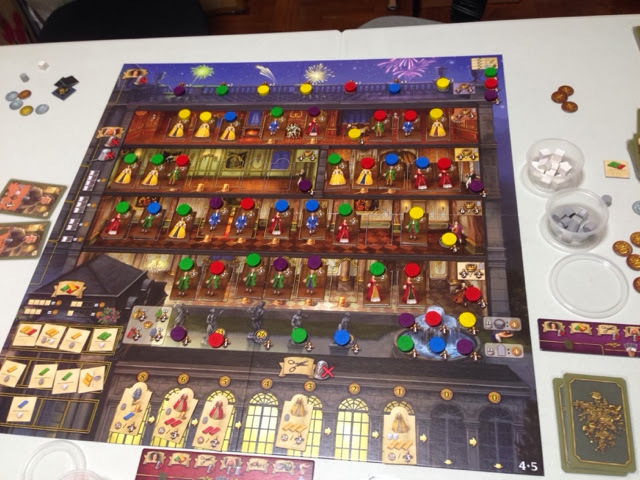 My trip to Essen was fruitless in the area that I was unable to get in a demo of the game. 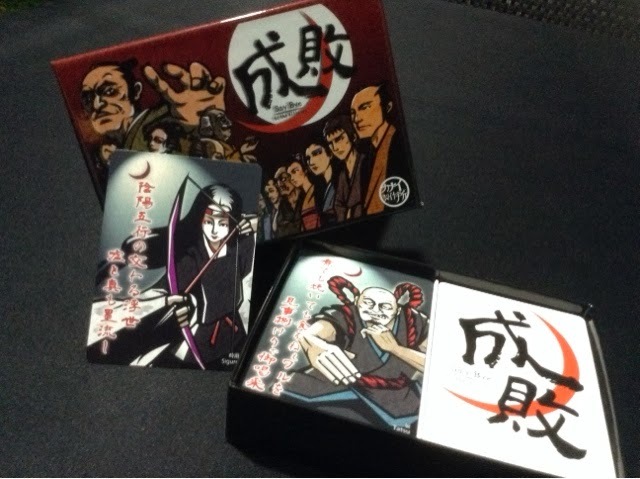 This might be too late to help the Kickstarter campaign for the game but i gotta try ! I had only recently ( read: yesterday ) downloaded the app for my iPad, and i LOVE the gameplay ! Its really very simple but strangely addicting. Each turn you get to flip as many cards ( one at a time ) from a face-down deck into the play area. You will choose/decide when to stop and bank all the cards. Should you draw a card of the same suit as one previously drawn, then you bust and all cards revealed are thrown into a discard pile. We are very happy and proud to join this growing network of awesome podcasts and family of podcasters. We hope to learn from everyone and bring our podcast to new heights! If you are a first time visitor to our site from the Dicetower network, WELCOME! Take a look at our blog for many many reviews and session impressions. Join our guild where we will always post the latest news with regards to our blog and podcast there. Feel free to drop us comments on this post or at our guild and if you like what you hear, leave us reviews on iTunes and help others find out about us. Look at all the pretty pretty dresses! Rokoko, one of the games that Jon and I were looking forward to, I think he more than me. Its a game about dress making and fashion and is an action selection game that combines deck building as well as resource gathering. Players try to manage obtaining resources to make dresses or buy decorations which will all lead to end game points. The deck building portion ties in with the action selection where each player will choose 3 cards to play for that round. Game lasts 6 rounds and there is a rather complicated end game scoring to be done and whomever has the most points will win the game. This is a 1 game impression and we had 5 players for this game. Lets take a look at what I have learnt. 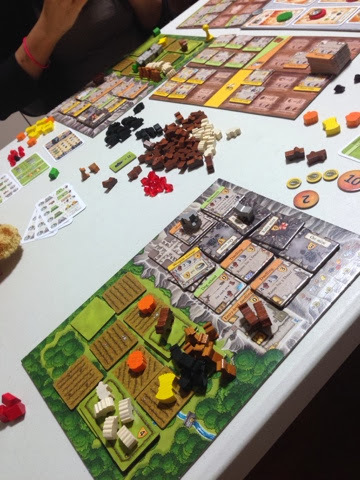 Caverna, another widely anticipated game from Uwe Rosenberg, is seen as a better version of Agricola and was released at Essen 2013. In essence this is quite true because it plays very similar to Agricola except for a few changes. Thematically we are all dwarves now (?!?) and we now have a mountain to dig into and build mines. Also that is where our rooms are now built. There is still a farming aspect where the normal Agricola features are available but with the new mountain area, it presents a new path to victory and that is expeditions. So did it work? And round and round our scoring marker goes! 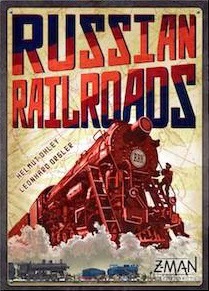 So if you have been following up on the releases at Essen 2013 and Fairplay list, you will know that Russian Railroads topped the Fairplay list and is one of our big surprises. I did not notice it because I had wrongly assumed that it was a game involving railroads (similar to 18xx) and thus all the preconceived notions about the game (takes very long, shares etc) did not appeal to me much and I gave it a miss. 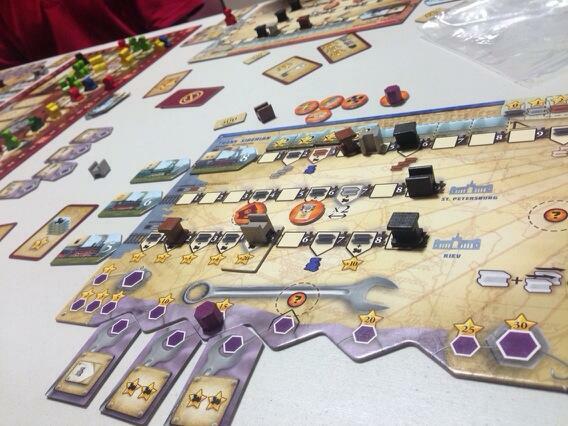 However judging from the responses I did take a look while Essen was going on and lo and behold, its a euro worker placement game with a railroad theme AND there is no laying of tracks involved! Quite a twist don't you think? I wonder if this is the first of its kind. So Dion came on by after dinner and we just HAD to give this a try and see what all the hype is about.